Do you feel like your mornings have gotten away from you? Like the morning is happening to you rather than YOU happening to the morning? I used to have a decent morning routine, but have let it slide lately. Without an intentional morning, I feel like I'm starting the day behind. I'm irritable and my home feels more chaotic. It's harder to find time for the important things and life generally feels less peaceful. I want my peace back! I'm TAKING BACK THE MORNING! Taking back the morning is not about getting up at the crack of dawn, but rather being intentional with the morning hours in order to make the most of this one precious life. Why Take Back the Morning? Because lives are changed in the morning hours. Decisions made. Hearts quieted. Souls searched. Morning is when you can set your day up for success. When you can begin to create the life you desire. Sure, we can do these things at others times, but morning is where stealing a few solitary moments to refresh ourselves makes a difference for the day ahead. What we do in the morning spills over into the rest of our lives. Do you need to take back your morning? If so, I hope you'll join me as I'm taking back mine. 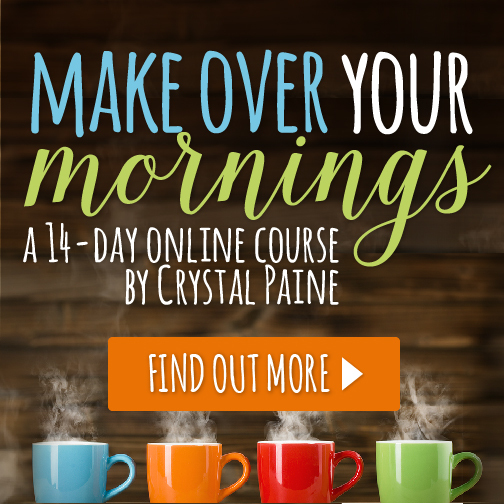 Here's what I know works for me (from past experience), plus a few tips I've learned from Crystals amazing Make Over Your Mornings 14-Day eCourse (which launches today!). Knowing what you will do when you get up makes all the difference. Jot down a plan of action the night before so you will be ready to go in the morning. You will feel so much more productive if you can start the day by getting something checked off the list. I find that productivity keeps on going. If I start out getting things done, I seem to be more productive for the rest of the day. A simple evening routine will allow you to focus on morning tasks without distraction. Do a quick tidy of the kitchen and prep the morning coffee pot. Lay out any books or journals you will need. Waking up to a prepared morning spot is inviting. A treat for getting out of bed! An accountability partner can help you get up on time consistently. Text a friend, join a Facebook accountability group , or even tell your kids to check on you. Knowing someone will be asking (or even waiting on you) will encourage you to get out from under the covers when you'd rather press snooze again. This is a given, I know. But it's just so easy to stay up late! You can't expect to have a successful morning if your aren't getting enough sleep. Coffee can only do so much. Sleep is what we need. I am excited to introduce you to a course that will liberate you from that hamster wheel of exhaustion! Do you need to take back your mornings? Taming the Paper Clutter Monster!